Statistics that nearly 18,000 metric tons of plastic waste are generated in Vietnam on a daily basis was one of the alarming messages delivered at an event held to observe the Earth Day in Ho Chi Minh City on Thursday. On average, one Vietnamese produces around 1.2kg of waste per day, and "16 percent of them is plastic," Quach Thi Xuan, director of Da Nang Centre for Consultancy on Sustainable Development, said at the seminar held by the Consulate General of the United States in Ho Chi Minh City. In reality, Vietnam’s population just reached 93.7 million last year, according to statistics by the General Office for Population and Family Planning under the Ministry of Health. This means Vietnamese people are generating nearly 18,000 tons of plastic waste a day. The expert added that only a small proportion of plastic waste in Vietnam has been recycled, and the rest still exists in the environment, particularly makes all the way to the ocean. Many recent studies have pointed out a scary prediction that if no action is taken, there will be more trash than fish in the ocean by 2050. In Vietnam, the coastal line provides livelihood for millions as well as food security for the whole country. “In my opinion, plastic pollution in Vietnam is really serious,” Xuan claimed. The expert warned that plastic is leading to ‘dead zones’ that are killing aquatic stock many people depend upon. “For instance, Vietnam has recorded cases involving sea turtles died from being trapped in fishing net or eating plastic waste,” she said. Another speaker at the event, Linh Nguyen, country manager of the Environment and Development Action in Vietnam (ENDA Vietnam), said, citing a World Bank study on waste classification in 109 countries, that Vietnam is the 17th-biggest plastic waste producer. Moreover, Vietnam also emits twice more plastic waste in comparison with other low income countries. Statistics that Vietnam is among the top five countries with the biggest plastic waste volume thrown into the ocean, with 1.8 billion metric tons per year, was also cited at the event as a call for action to change. 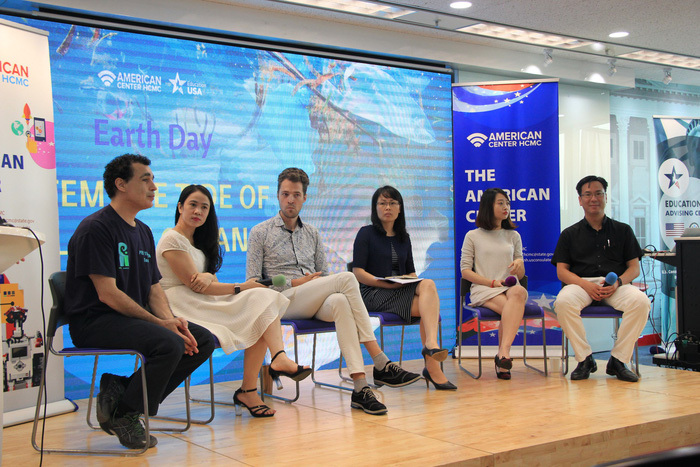 “The accumulation of marine debris is a human-made problem that requires a human solution,” U.S. Consul General Mary Tarnowka said at the seminar. The Great Pacific Garbage Patch is currently six times bigger than Vietnam with 90 percent made of plastic waste, according to David Saiia, co-founder of Rescue Everything Institute, an organization dedicated to technology for full life-cycle solutions for plastic waste. A simple and practical solution for the problem is 3Rs which stands for Reduce – Re-use – Recycle. “Do you need an extra plastic bag at the supermarket? Or can you bring your own? Do you need a plastic cup and straw at the bubble tea shop? Or can you bring your own mug? Do you reuse plastic bags or throw them away?” Tarnowka gave out a bunch of questions, which she said everyone should ask themselves. Michael Burdge, co-founder of Zero Waste Saigon, a social group and network working on solutions to decrease plastic consumption, also offered his “powerful tool” for people at the event. “When you order your water, say ‘no plastic straw’,” he said, expressing the small action can lead to bigger change. “Refuse”, as Burdge’s method, is also a step that “extends” 3Rs to 5Rs including Refuse - Reduce - Re-use - Recycle – Rot. However, according to the environmentalists, the waste processing system in Vietnam has not been synchronized, leading to a reduction in the efficiency of waste classification. In many places, sanitation workers will also mix up classified waste and put all on garbage truck. Besides educating to raise people’s awareness, there is still a need of government’s regulation on plastic waste. ENDA Vietnam’s country manager gave an example about the helmet regulation in Vietnam. “At first when the regulation took effect, people obeyed because they were afraid of traffic police, but now if we ask why people wear helmet, their answer would be ‘to protect myself’,” she addressed.